I could be the only Montreal Jew I know who has avoided going home to Israel, despite dangling freebie trips and subsidized holocaust-to-the-holy-land tours. It’s true I was a crack fundraiser for the Israeli dream as a child in Jewish school, but I didn’t want to fall for a soldier (let alone be one) and burn my fire in the pit of uber-nationalism*- no matter the crazy-making history that inspired it. Instead, I dedicated myself to the creation of art, diving into the fear and glory of the human heart. I am far from alone. Meet Etgar Keret; Israel’s rock-star writer and prize-winning filmmaker with the undeniable holocaust pedigree, who smacks our fleshy cards on the table with his emo-essays and wild-haired tales that are perfect for the wee-attention span of the internet age, as they get to the point, to the aching heart of the matter but fast. I am hankering to meet this non-politico provocateur and self-proclaimed lousy soldier who describes his wife as smart, but I will be dancing the hora in the City of some Jews (Miami) while Keret is prancing through Montreal as it springs to life on April 21, with the English-language release of his latest collection of earthly delights, Suddenly, a Knock on the Door. What are the first words you ever wrote? ‘I love my brother’. But that’s because my older brother, who had taught me how to write, made me write them. What’s your writing routine? There is no routine. I only write when a story comes. Do you like your own writing? Hey, I’m my stories’ dad. If I won’t like them who will? What does being Jewish mean to you? I can’t answer this one without using my hands. What scares you the most? Losing people who are close to me. Do books have a future? Stories have a future. The form is less important than the essential truth that people will always want to tell and to hear stories. If you could smoke a doob with another writer, who would it be? Oh, I’ve already smoked with him but I’m too discreet to tell. If you couldn’t be a writer, what would you be? Sad. What would you title the story of your life? Yearning burning hemorrhoids. *Not to say all Israelis are war-mongers. 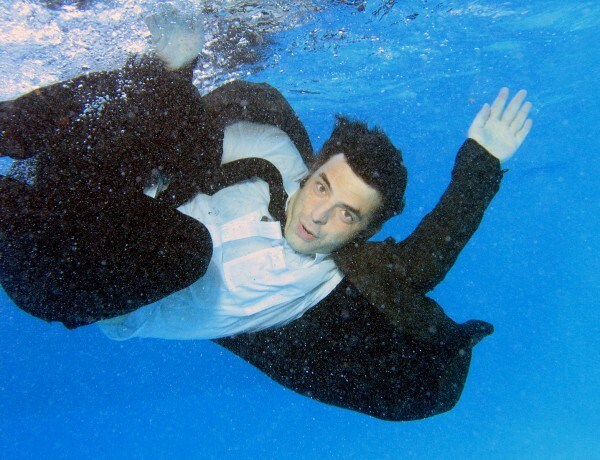 Etgar Keret will heat up the stage at Montreal’s literary bonfire, the Blue Metropolis Festival on April 21, and sit cozy at the Jewish Public Library. Please go bask in his dark/light… for me. FYI, Etgar Keret is a regular contributor to the fantabulous ‘This American Life’. Just sayin’. Check out ‘Make Art, Not War’ re-posted on Montreal’s Rover! Here’s some more stuff I’ve blogged about writers who are Jews, too. Ok, Philip Roth. Wait! And Lena Dunham, representing half-Jews everywhere. I loved it. The reply to ‘the first words you ever wrote’ question was sweet in the best way. I really look forward to reading some of Keret’s work! Very sweet and clever. Tak-tak-tak-smooth like air-hockey. What a refreshing portrait of both Keesal and Keret! Seconds, please. I returned last night from the March of The Living a 2 week emotional roller coaster with a busload of 16 year olds. By far the most fascinating, emotional, gut wrenching and gratifying 2 weeks I have ever spent. Belzec with its memorial and scorched earth with rebar twisting out of the ground looks like an alien species landed on earth and set down some kind of unholy remnant from another civilization. It is that scary, that out of place. However the worst remains the tour of Majdanek, the most preserved of all labor/extermination camps. Nothing prepares the rational mind for the horrors that can be seen. Thanks for sharing your experience, Ivan. That is powerful stuff. What kind of effect do you think it had on the young people you were with? I certainly did not mean to imply that all Israelis are war-like. As far as I can tell today, many, if not most, are not, and I added a note above to that effect. If you couldn’t be a writer, what would you be? sad…I love this line. So true. I love your blog, BTW. Hi from London! I think Etgar’s answer was bang-on for most writers. Thanks for your kind words. I look forward to reading more about your life in London! This guy is the best. I own all of his short story books. When’s he coming to Chicago?! Etgar’s website for more info. Enjoy!